YAY,I was wondering when we would see one of the other tribes .But I want more explosions .I want to know about the wars in depth . Good job by the way with that pic. Here are some Naucean Instruments. The Naucean Horn may be familiar but the rest may be new to you. The Naucean harp is a combination of a harp and string base. It can change its pitch greatly by tightening or loosening the strings and is amplified by the hollow inside. The Fluke Drum is played by hitting it with their tali flukes. They come in many sizes and are some times filled with water and make much diffrent sounds when that happends. The Rain Shaker is made from a spike gourd plant. It is filled with sand or seeds and is shaken like a maraca or rain stick. Lastly the Wind Whip is actually an instrument. It is used by swinging it around. The swinging of the balls on the rope make diffrent pitch sounds based on the rope length. Also the balls on the end have holes in them which also make nose because each has a diffrent size ball. These whistle while the rope hums. It can also be used like a whip and make a cracking sound. 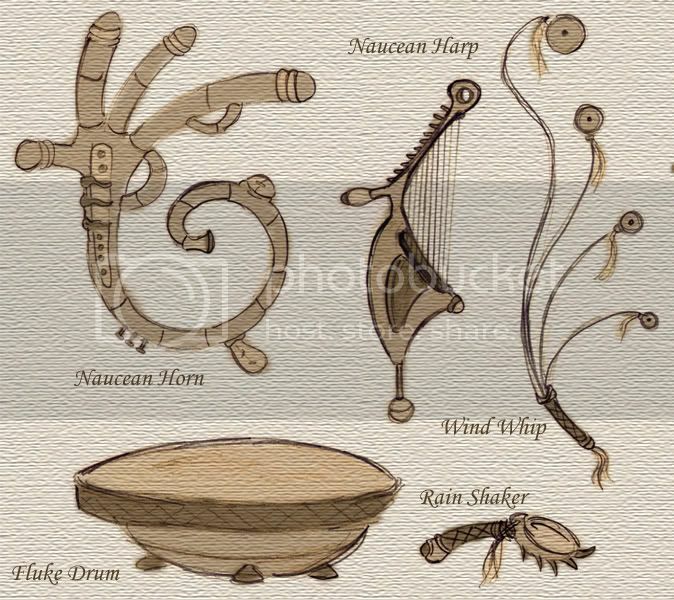 These are all instruments mainly used by the River Tribe. The desert tribe actually reminds me of a Lambeosaur. Anyway, I'm kinda interested in the cave tribe myself. And those instruments are pretty cool. I want one of those Wind Whips. Yeah, thats a great idea. As far as I know there arent many examples of an instrument based on that principle which is that developed. These are all instruments mainly used by the River Tribe. River Tribe was the slavers, right? Well, I guess that explains the wind whip. What better way to combine slavery and entertainment? Preshistoric - Just a nest for raising young. Otherwise they stayed in the ocean. Stone Age - A small mud dwelling with a firepit inside. Copper Age - A domed reed and mud hut. Bronze Age - A spherical reed house on thin stilts. Iron Age - A spherical thatch and stone on thick stilts. Medieval Age - A double sphere stone tower with defense spikes and slit windows. Renaissance Age - A triple sphere stone tower with large defense spike and slit windows. Exploration Age - A triple sphere adobe brick tower with adobe shingles and windows in the cylindrical part. Also 3 chimneys. Industrial Age - A triple sphere adobe brick tower with adobe shingles and windows in the cylindrical part. Also 5 chimneys and oil lamps. Flight Age - A quadruple sphere adobe brick tower with adobe shingles and windows in the cylindrical part. Also 7 chimneys and oil lamps as well as a airship port. 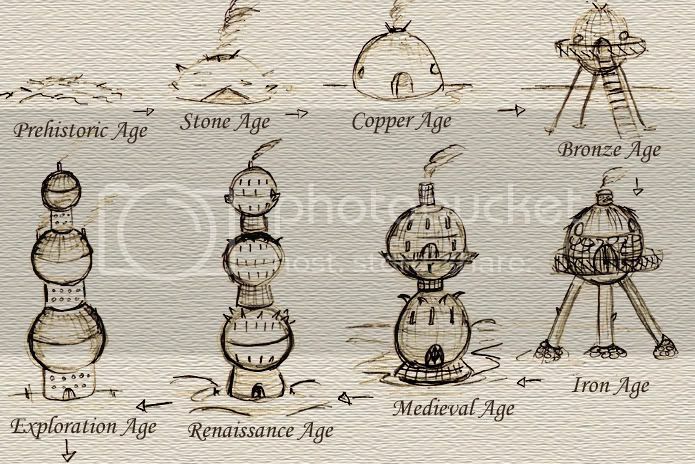 Anti-Slavery Age - A quadruple sphere adobe brick tower with adobe shingles and windows in the cylindrical part. Also electric poles. Atomic Age - A quadruple sphere cement brick tower with adobe shingles and windows in the cylindrical part. Also electric poles and radio antenna. Rocket Age - A quadruple sphere cement brick tower with adobe shingles and windows in the cylindrical part. Also electric poles, radio antenna and a billboard. Modern Age - A 5 sphered steel and glass sky scraper with windows all over. Also underground powerlines, satlite dish and billboard. Digital Age - A 5 sphered steel and glass sky scraper with windows all over. Also underground powerlines,, satlite dish and hologram billboards. 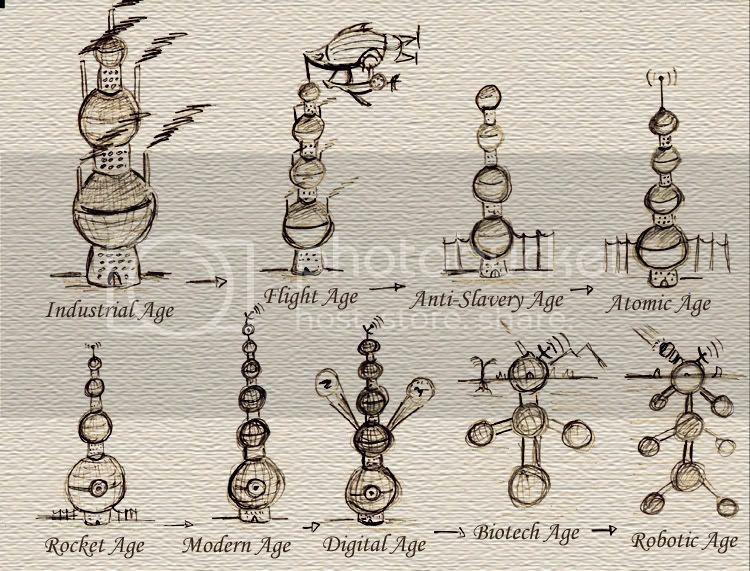 Biotech Age - An underground 5 sphered bomb shelter to protect from the genocide plague. Also laser cannon, nuclear power plant and satellite dish. Robotic Age - An underground 9 sphered bomb shelter to protect from the robotic uprising. Also anti-matter cannon, nuclear power plant and satellite dish. also, wouldn't they have bunkers or something in the Atomic age? because if I remember right, that animation of the world population through time (which unfortunately doesn't exist anymore since I tried to find it, but only found a broken image) showed that there was a sudden decrease in population at that time which I think an atomic war happened. Yes but not all were destroyed. There was enough left to recover from, unlike the last ages. I wanna know more about the Robot Uprising!